So I'm sure you've noticed that this site hasn't been as full of posts as it usually is. That's due to some combination of me being pregnant (and so sick that I hardly moved off the couch for about 12 weeks), and that I haven't asked for any new contributors and guest posters in a while. I love having other writers. This site certainly cannot be "Alabama Bloggers" if it is written by ONE Alabama Blogger. BUT, I don't ever want any of my contributing writers to feel like they have to contribute forever - I fully expect for there to be a "season" of contributing that fits within your life schedule and writing inspiration. That season of contributing has come to a close for many of my writers, as they've had new babies or picked up new projects. So it's time to search for new writers! The topics that can be written about here are very broad: anything Alabama related (food, places to visit, authors, sports, politics - anything), social media, blogging tips, features of Alabama Blogs, anything. Also, the posts do not have to be exclusive - if they've been published before on your blog, that is perfectly fine with me. So, if you'd like to be a contributor and get your blogging in front of a different audience, let me know! I'd love to have you. If you have a recurring column you would like to do, that would be great - you can pick the recurrence level. Or, if you just have one post that you would like to share, I would love that too. You can comment on this post, or email me directly at rachel@alabamabloggers.com. Thanks!! I can't wait to hear from you! Blogging Conference Coming to Birmingham! Blogging conferences are a great way to learn great tips and to network with other bloggers at the same time. Most of them tend to be in the big cities (Chicago, New York City, Las Vegas), but there will be one in September in Birmingham! WordCamp Birmingham will be held September 18-19th at UAB Heritage Hall. The conference cost is a VERY affordable $40, and there will be quite a lineup of great speakers and topics. Although the central theme of the conference is regarding the Wordpress platform, I've been assured that many topics covered will be relevant to all bloggers, regardless of platform. And I'm personally hoping to be able to attend because I'd love to MOVE my blogs to Wordpress at some point in the near future, and there will be many experts on hand to help with all of the details and technicalities of such a move. So, if you'd like the opportunity to learn more about blogging and meet other local and regional bloggers, check out the WordCamp Birmingham site, follow @wordcampbham on Twitter, and register to attend! We had a great time visiting at Taziki's today, and had the special pleasure of having Mellanie, the marketing director of Taziki's, catering to our every need and visiting with us! Okay, we didn't make her get our drink refills or anything, but it WAS nice to have someone help me get some tables together. Thanks for coming everyone! It was great to see you! If you weren't able to make it, we hope to see you next month! Watch the blog and Twitter for scheduling. It's time for another meet-up, and everyone is invited, as always! Don't forget about our meet-up tomorrow!! I hope to see you there!!!! The July Meet-Up Date is Friday, July 16th at 11:30. We'll meet at Taziki's at Chace Lake in Hoover. If you plan on attending, RSVP here or on twitter (to @AlabamaBloggers) so that we know to look for you! But, as always, if you can come at the last minute, feel free to! Be sure to tweet and let your fellow Alabama Bloggers know about the event! The hashtag is #AlaBlogMeet. The winner of the $60 CSNStores giveaway was randomly chosen.... entry #100, Gina! Congratulations, Gina! Email me and I'll get your information! I love trains. I'm not sure why. Trains seem to bring an almost magical feeling. The dream of taking you away while always bringing you home. 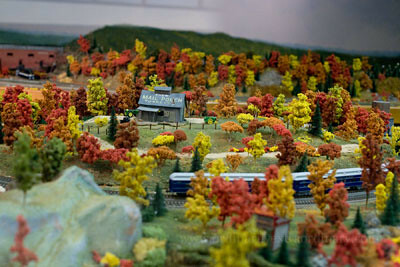 And having a son we seem to be drawn to trains and model train exhibits a lot. I love living in a town where the trains run through the middle of town. 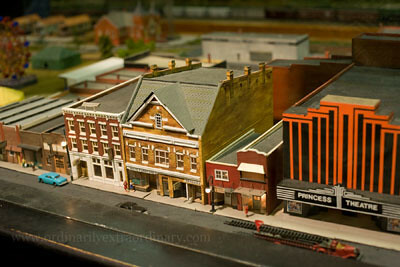 I'm always on the look out for model train exhibits and museums. 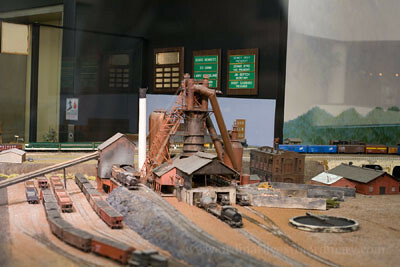 In the past we've visited the model train exhibit at the McWane Center, but I'm unsure if it is a permanent exhibit there. 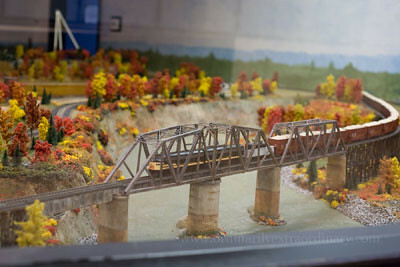 I'm not sure if the one shown at the McWane Center is shown by the Magic City Railroad Club or not. 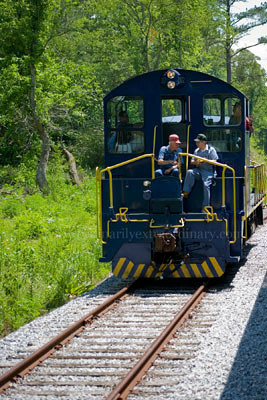 We've also visited the Heart of Dixie Railroad Museum in Calera, Alabama. 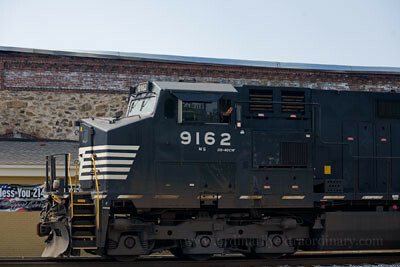 I could wander around amidst the old trains for hours I think. 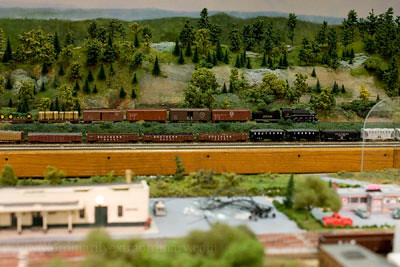 Recently on a trip back home to Northeast Alabama my parents mentioned an article in the paper about a model train exhibit in Gadsden, Alabama. 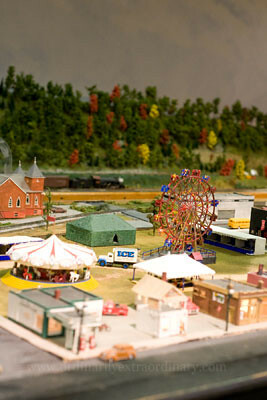 Located in the Cultural Arts Center, this 72 foot long model railroad is operated by the Coosa Valley Model Railroad Association. 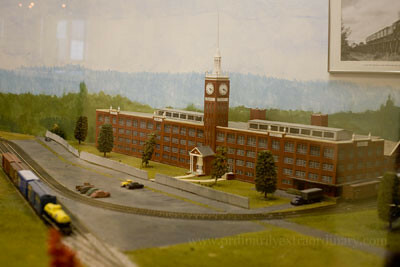 A replica of Gadsden in the 1940s, the exhibit houses models of the Goodyear plant, downtown Gadsden, the Coosa River and much more. 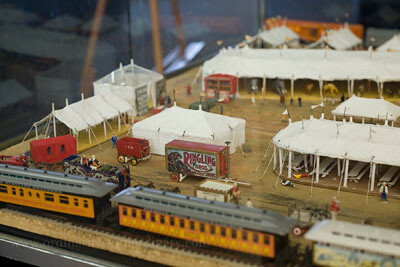 Admission is $6 for adults and $5 for children 3 - 12 years of age. Tuesdays are free between 12 and 5 p.m. 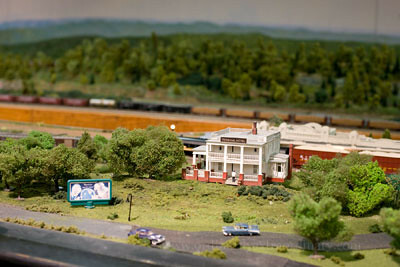 So are there model railroad exhibits or train museums in your part of Alabama? If so please share in the comments. We'd love to visit them. If you plan on attending, RSVP here so we know to look for you! But, as always, if you can come at the last minute, feel free to! I’ve just run across a fairly new blog with which I was immediately impressed, so just had to share. I found EatBHM via one of my favorite restaurants, Taziki’s Mediterranean Cafe, and I am so glad that I did. EatBHM is a very well writtten, fun to read new endeavor by an anonymous 30-something professional in Birmingham. It is her intent to document her journeys through the delicious and original cuisines of Birmingham. I am personally excited about her mission because I feel like we have SO many wonderful restaurants in Birmingham that are locally owned and absolutely excellent. But more than that, I am impressed with her seemingly expert ability at blogging, despite the newness of her endeavor. EatBHM was inspired by the EatJXN blog, which highlights the eateries in Jackson, Mississippi. Also, she’s totally worth following on Twitter, not only for her fun dialogue and banter, but for her occasional free food giveaways! Welcome these New Alabama Bloggers!!! 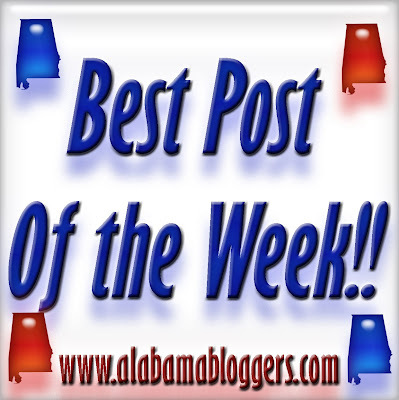 Instead of doing best post of the week today, I thought we should welcome these newly listed Alabama Bloggers! Hop over to their blog and welcome them to the network!! For the complete list of Alabama Bloggers, check out The List! Giveaway! Win a $60 Gift Certificate! CSN Stores is an internet mega-mart, consisting of over 200 online stores where you can find everything from cookware to cribs, or even your most specific needs such as a store just to find the perfect bathroom vanity! You can find a listing of all of their stores here, where you will find excellent drill-down and search capabilities in each one! Their websites are set up very well to help you locate exactly what you need. If you would like to try out CSN stores for yourself, they have offered a $60 gift certificate for us to give away to one of you! Simply leave a comment on this post of what you might go shopping for. Best of luck! This giveaway is open until Monday, July 12th. The winner will be randomly selected and posted here on Tuesday, June 13th. Disclosure: I received no compensation or review products for this giveaway. My opinions are always my own.